The more challenging step may be collecting the data you need to fill in the blanks. All of these data points should be found on the manufacturer’s specification sheets, with the exception of available capacity. 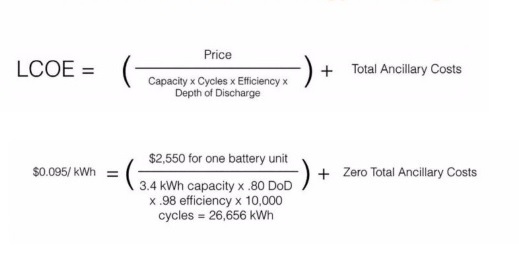 Price is the published price point for the battery, regardless of stated capacity, depth of discharge or other performance parameters. Cycles is the number of full charge and discharge cycles expected over a battery’s warranted lifetime while it has at least 80% of its original published capacity left, which is the industry standard end of life definition (EOUL). Be aware that some battery manufacturers do not disclose the EOL for their battery, which makes it difficult to assess LCOE accurately. Others do not hold to the EOL industry standard of 80% and allow 60% to 70% degradation during the warranted life of the battery, which negatively impacts the LCOE. for batteries such as lead acid or lithium cobalt oxide-based batteries such NMC (lithium nickel manganese cobalt oxide) to safeguard against overheating, fire or voiding the warranty. As an example, a 3.4-kWh (67 Ah) battery with 100% depth of discharge can deliver 3.4 kWh or 67 Ah of power. For a lead acid battery. 3.4 kWh (67 Ah). which could be damaged if discharged to 100%, should be limited to approximately 50% (3.4 x 0.5 = 1.7 kWh). This example illustrates how DoD has a significant impact on available energy in any given installation, beyond the nameplate or published capacity. To make up for this loss in available Wh due to shallow discharging, more batteries and larger installations are often required to make up the difference, requiring more space and weight per pound to provide the same amount of power and energy than batteries that do not require shallow discharging. Efficiency rate indicates how much energy is lost or maintained in the charge and discharge cycle, or how much energy can be effectively stored in the battery and pulled back out for use. The higher the efficiency, the less loss in Wh, the smaller and lighter the batteries, the smaller the installations and the more efficient use of space and weight. Lower efficiency rates, shallower depths of discharge and longer charge and discharge times (beyond two hours) are all techniques employed by some battery manufacturers to protect against overheating and thermal runaway. This can significantly reduce the total efficiency of the system, leaving less usable energy for offsetting electrical loads in an installation. Thus, the LCOE is $0.095 cents per kWh. This is lower than the national residential average electricity rate of $0.12/kWh. In addition, such a battery will deliver 34 MWh over its useful warranted life by the time it reaches its EOL of 80%, likely with many more years at a reduced capacity beyond the EOL 80%. 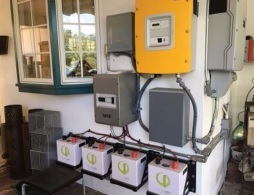 In addition to the LCOE analysis developed above, which is based on the performance profile of the battery itself, contractors should also factor in other ancillary costs of the installation that erode a lower up-front price point, as well as the LCOE. • How much valuable project space are the batteries going to occupy? • Weight—how much is it going to cost to ship in terms of per Wh, per pound? or other equipment to install the batteries?